BUCKNER, Phillip (ed.) — Canada and the British Empire. BITTERMANN, Rusty, and MCCALLUM, Margaret — Lady Landlords of Prince Edward Island: Imperial Dreams and the Defence of Property. CAVALLO, Sandra — Artisans of the Body in Early Modern Italy: Identities, Families, and Masculinities. BUMSTED, J. M. — Lord Selkirk: A Life. MILTON, Cynthia E. — The Many Meanings of Poverty: Colonialism, Social Compacts, and Assistance in Eighteenth-Century Ecuador. SIMPSON, Antony E. — Witnesses to the Scaffold: English Literary Figures as Observers of Public Executions: Pierce Egan, Thackeray, Dickens, Alexander Smith, G. A. Sala, Orwell. HUTSON, James — Church and State in America: The First Two Centuries. PLOKHY, Serhii — Ukraine and Russia: Representations of the Past. CHRISTIE, Nancy (ed.) — Transatlantic Subjects: Ideas, Institutions, and Social Experience in Post-Revolutionary British North America. ALVAH, Donna — Unofficial Ambassadors: American Military Families Overseas and the Cold War, 1946–1965. 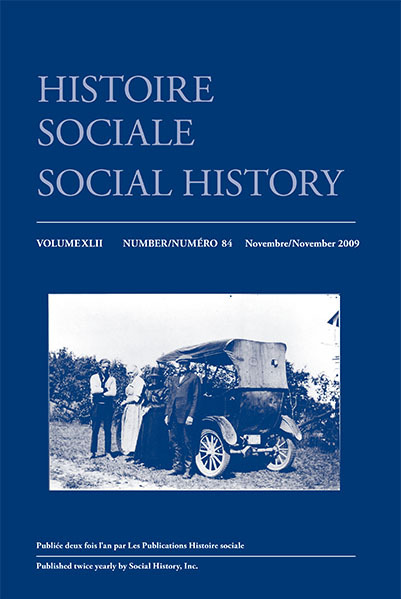 KRAMER, Alan — Dynamic of Destruction: Culture and Mass Killing in the First World War. IGO, Sarah E. — The Averaged American: Surveys, Citizens and the Making of a Mass Public. FAHRNI, Magda, and RUTHERDALE, Robert (eds.) — Creating Postwar Canada: Community, Diversity, and Dissent, 1945–1975. KOWALESKI, Maryanne, and GOLDBERG, P. J. P. (eds.) — Medieval Domesticity: Home, Housing and Household in Medieval England. CALICHMAN, Richard (ed.) — Overcoming Modernity: Cultural Identity in Wartime Japan. PARKER, Roy — Uprooted: The Shipment of Poor Children to Canada, 1867–1917. RAVEL, Jeffrey S. — The Would-Be Commoner: A Tale of Deception, Murder, and Justice in 17th-Century France.